We’ve been to an amazing Basic Bike Maintenance course yesterday at the new Evans Store in Crouch End. They run every other week at many of their stores now and are completely free! It’s well worth popping down to pick up some tips on how to keep your new bike up and running with a little TLC every once in a while. The tools you need are inexpensive and of course they’re available there and then. Speaking of which, since Evans Crouch End is a brand new store, they’re running a 10% off campaign until the end of July – that’s for accessories and even FULL BIKES as well! Get the voucher here. Can’t get to Crouch End but still want a discount? Register for SkyRide and get 15% off accessories at Evans nationwide. I had never realised how much more convenient it is to work and check a bike when it’s on a proper mechanics stand. It makes the world of difference looking at your bike at eye level rather than hunched over or on your knees – not to mention that you can spin the pedals at all times. My next investment will have to be one of those. 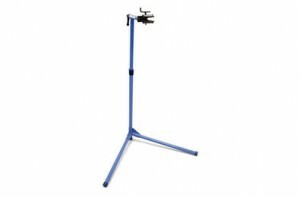 The bike is held by its seat post and you can walk around it and look at ever part with ease. 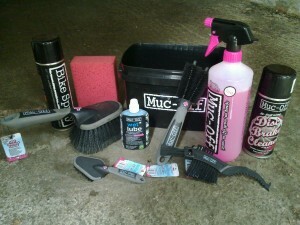 For about £90 it’s not the end of the world – and probably one of the most expensive bits of equipment for maintenance. You also want to get yourself one of those multi tools sometimes known as a Leatherman. For about £10 an investment that should stay with you at all times – on and off the bike. Jason used mine the other day to repair a Digi Beta machine. Impressive! Your chain is arguably the one thing that gets used the most – apart from the tyres maybe. So it deserves much more care than I’ve ever given it a thought. 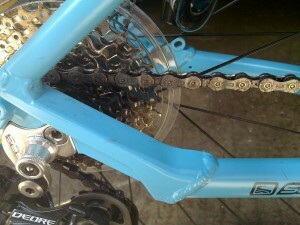 Let’s start with the most obvious observation: when your chain is dirty it needs a clean. Dirty chains contain lots of sand and dirt, even grit and metal you may have picked up on roads you thought were fairly clear. You never know. 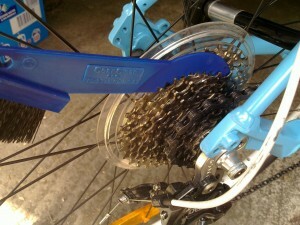 Those bits grind the chain down over time and will cause damage to your sprockets. The easy solution: clean it every once in a while. 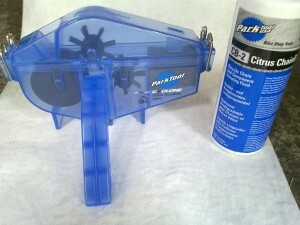 You can do this rather easily with a Park Tools Chain Cleaning Kit. You fill it up with degreaser, pop the chain in and turn your pedals back while the brushes on the inside do the hard work. Don’t forget a linen cloth to wipe off excess degreaser afterwards (that’s an old T-Shirt or a tea towel – but NOT a disposable kitchen towel because they’ll leave bits behind). Once the chain is cleaned, lube it with a thin coat of either wet or dry lube. DO NOT use stuff similar to DW-40 – apparently those things can get into the fine parts of your mechanics and drive the grease out over time. Dry lube is much thinner but washes off quicker when it rains, wet lube is a bit thicker and stays on for longer in wetter weather. Dry lube repels dust and sand better though, while wet lube tends to pick up a lot of dirt in dry weather. So dry lube in the summer, wet lube in the winter. They’re both about £4 per bottle so maybe we’ll get both and test it out.